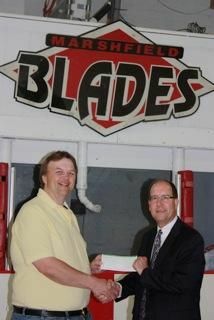 John Baur, Community Bank President, Relationship Manager with Associated (right) presents Scott Berg, President of Marshfield Youth Hockey Association (left) with check to Marshfield Youth Hockey Association's "Learn to Skate" program. Associated Bank recently acknowledged the efforts of its top 20 volunteers, with a $1,000 grant to the non-profit organization of their choice. Associated is committed to giving back to its communities. Hundreds of Associated colleagues live that commitment in their communities throughout the year as volunteers — serving as donors, organizers, leaders, inspirers, and doers.